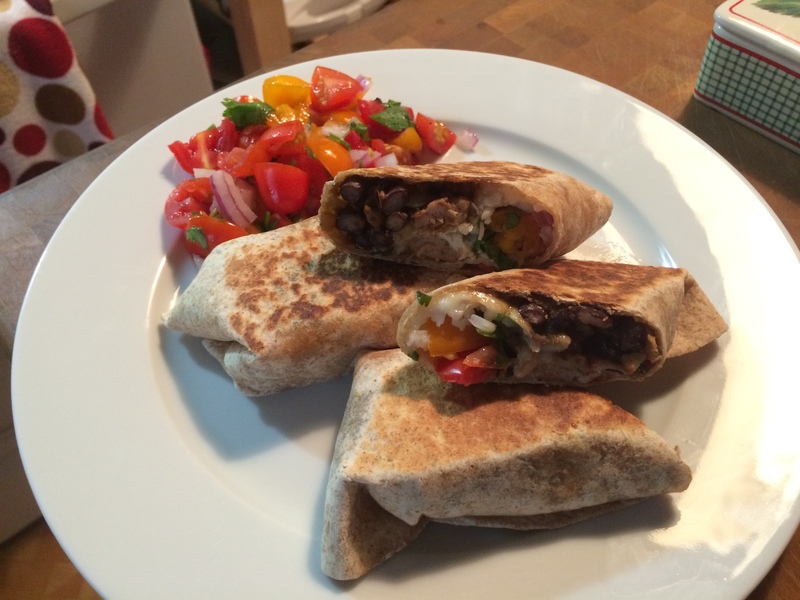 These burritos are so delicious and easy to make. Grilling the outside of the whole grain tortillas gives extra texture making these burritos awesome. So for this dish I start with 1 package of chicken sausage. It’s leaner and with the spices inside the sausage has really nice flavor. I take the meat out of the casing first. Next in a large saute pan I saute 1 large diced onion in 2 tablespoons of olive oil. After the onions have started to soften, I sprinkle in some Kosher salt, just about 1 teaspoon and 1 teaspoon of crushed red pepper flakes. To that I add in 3 minced garlic cloves. Nest the chicken sausage. Now while the sausage is browning and cooking with the onions and garlic, to add even more flavor, I add 2 tablespoons of Fajita seasoning. Next I add in 1-1/2 cups of low sodium chicken broth. You need a little liquid to create a sauce for the sausage to simmer in and soak up all the flavors from the seasoning. As it’s all bubbling away, I squeeze in a splash of fresh lime juice. I start out with the pan on med high heat until the liquid has reduced by half. then I turn it down to medium. After simmering for around 15 minutes you’ll see all the liquid has been absorbed by the sausage. I add in 1 can of rinsed and drained black beans. You just want to warm the beans through. Now with the heat turned off, I add in 1/4 cup of fresh chopped cilantro and stir through. Moving on, it’s time to put these bad boys together. I’ve made some Pico de gallo and cilantro lime rice to also go into the burritos. You can get those recipes for those, from earlier posts. I start by warming up 8 whole grain flour tortillas. I put them on a plate with a damp paper towel over them and microwave them for just about a minute. This makes them pliable. I start out placing the sausage on the bottom third of the tortilla, then a spoon of some Colby jack cheese, the rice and then the Pico de gallo. Remember to not put too much of each ingredient or the tortilla will break. Roll the tortilla up over all the items, tuck in the sides and finish rolling. At this point I take non-stick cooking spray, and spray a little on each side. I place them in hot a non-stick saute pan with a grill press on top. You could just use something with some weight to it to press down on the burrito. Check it after about 30 seconds or so, they brown quickly. Flip it, and do the same to the other side. I slice them on the bias and serve with a some more of that great Pico de gallo. You can see the layers of deliciousness inside. I have to say I felt really good about this dish. Using leaner meat, and a whole grain tortilla, this meal was totally guilt free and super satisfying.